Good morning everyone! 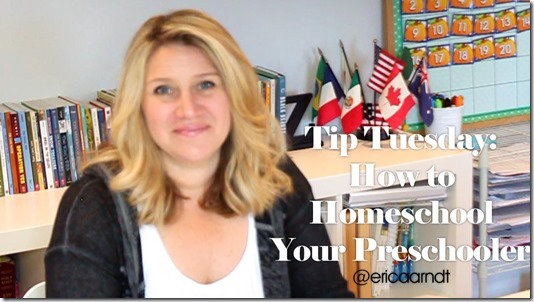 For today’s Tip Tuesday I’m sharing my tips on what to teach when homeschooling your preschoolers! In this video I share quite a few ideas, and of course I wouldn’t recommend trying to accomplish all of the items I’ll be listing in one day! The goal for preschool is to offer your child a wide variety of activities that will cover many different skill sets in any given week. Homeschooling a preschooler is probably one of the most exciting times. They’re excited to learn, and keeping school fun at this age is a must! While there aren’t any specific curriculum requirements for preschool, I encourage you to focus on creating a love of learning and keep your curriculum to the basics. Preschool is the perfect time to start because you and your child will have the opportunity to grow and learn together. In essence, preschool is a very forgiving year. It’s a time to try new things, enjoy time with your child, create fun art, make mistakes, change the way you do things, get a schedule figured out, and in a nutshell get acclimated to homeschooling. I like to use the preschool year to help students get used to a little more formal schedule without the pressure of having to do a certain amount of hours or days. It’s a nice transitional year from free toddler playtime to more structured homeschooling. So grab yourself a tea and sit back while I share some of my tips for homeschooling your preschooler! 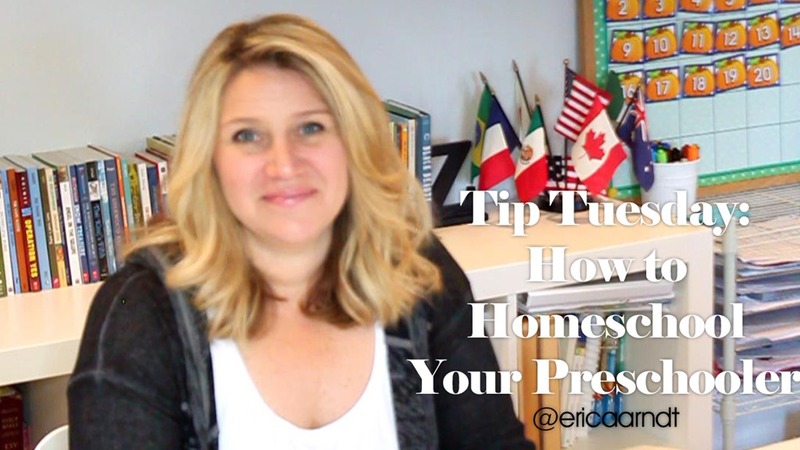 Watch this week’s Tip Tuesday: How to Homeschool Your Preschooler here! 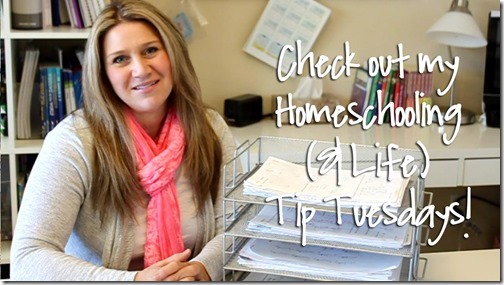 More information on how to homeschool for preschool! 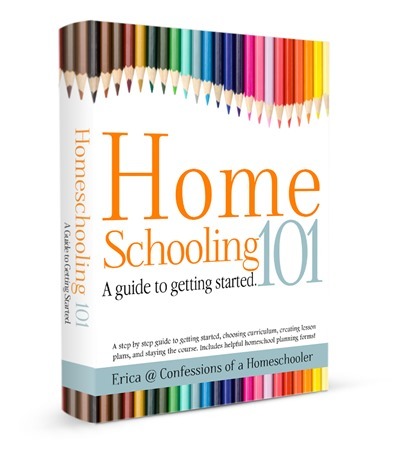 Homeschooling 101 is a step by step practical guide that will help you to get started, and continue on in your homeschooling journey. It is designed to help guide you through all of the steps to getting started, choosing and gathering curriculum, creating effective lesson plans, scheduling your day, organizing your home, staying the course and more! It even includes helpful homeschooling forms! The Letter of the Week preschool curriculum is a full 26 week preschool course designed to give your student a head-start on preparing for kindergarten! It is a 26 week curriculum that’s full of educational activities that focus on the letter recognition, sounds, number recognition, counting, basic math skills, pre-writing practice, and all the necessary fine-motor skills that will be required for your preschooler to be ready for kindergarten! Included are weekly lesson plans that cover all the subjects a preschooler needs and more! Ready for something more challenging? My K4/K5 Kindergarten Curriculum is a FULL 34 week Kindergarten Curriculum! The K4 Curriculum is great for kids age 4-5 who are ready for Kindergarten. The curriculum introduces beginning reading, math and handwriting skills that will give your student a huge advantage as they proceed through their elementary years. Upon completion of this program, students will have a basic understanding of simple addition and subtraction, place value, basic 1 and 2 vowel words, and beginning reading skills, logical thinking and much more! With this curriculum you also receive 34 weeks worth of daily lesson plans to help guide you through a full year kindergarten skilled activities. It comes with 34 weeks of Lesson Plans, and several added printables not previously available! Want to see more of my Tip Tuesday Videos? 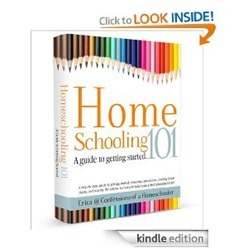 Make sure to click the image below to check out all of my homeschooling tips!